On this page you will find all the infant safety equipment items you will need to keep your baby safe in the nursery. Your baby's life is fragile and precious and her brand new world is full of hidden dangers - even in the nursery room. From tipping furniture, to suffocating crib bumpers the hazards are everywhere. Make sure your baby nursery is safe for when your little one comes home by investing in a few simple infant safety products. If you aren't sure where to start with baby-proofing your baby nursery, or if you just want to make sure you have everything covered, don't miss my comprehensive nursery safety checklist. Our Essential Baby Safety Equipment Store is divided into categories for your convenience. Just choose a category from the list to the right of the store and click on it to open. If you don't find what you're looking for in the above Baby Safety Equipment Store, type in a search term below to search the entire Amazon.com site or choose a department to search from the drop down menu next to the search box. A sound monitor is essential for staying in touch with your little one when you are in another room or just outside hanging out the washing. One half of the monitor stays in your baby's nursery room and you keep the other half with you. 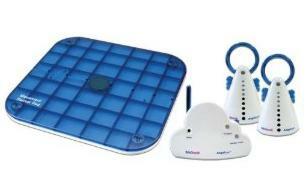 The best monitors also have a movement pad which detects any break in your baby's breathing. After a certain number of seconds an alarm will sound to alert you. I bought my Angelcare Movement Sensor by Bebesounds when I had my third baby. My second died of SIDS and the monitor gave me the peace of mind I needed to prevent complete paranoioa from setting in! Also look out for the video monitors that are now widely available. Tiny fingers can get very badly hurt by doors and drawers closing on them, so make sure to protect your baby's fingers by installing latches and locks on every drawer and cabinet in your baby nursery. Little ones will put their pudgy little fingers into every hole, crack and crevice they can find. Cabinets and drawers full of goodies are just explorations waiting to happen! This is going to be your baby's room afterall. Sooner or later he or she will want to explore it from top to bottom. Safety latches and locks should also be installed on every cabinet and drawer in your home that contains something you don't want your baby getting in to. Poison cabinets in the garage and detergent cabinets in the kitchen, as well as, your medicine cabinet are obvious examples. However, what about your sharp knives, crystal, fine china, DVD collection, priceless books etc? 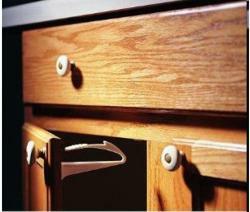 Adhesive locks are the best because there is no drilling required and, therefore, no permanent damage to your cabinets. Another no-drill option are these magnetic adhesive locks. 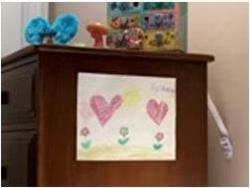 Dressers can tip when curious little ones open drawers and climb on or in them and bookshelves can tip when toddlers try to climb up the shelves to reach the top. They can decide to go after that toy for themselves in a split second while your back is turned. Heavy furniture can crush your baby if it tips on her - don't take chances - strap your furniture to the wall throughout your home using anti-tip straps like these. Attach these baby safety equipment items to any furniture or surface in your nursery with sharp edges or corners, especially if the surface is at your baby or toddler's eye level. A sharp night stand corner, for example, can easily injure your little one's eyes or nose if they fall against it. In fact, corner and edge bumpers should be used throughout your home. The best way to find all the sharp edges and corners in your home is to get down on your hands and knees and do a crawl about! 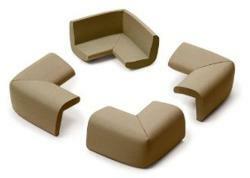 These corner bumpers can be trimmed to fit your table exactly, so they are one-size fits all. Or, if you have an especially thick table try these jumbo corner guards. This padded edge bumper will go all the way around your table if you need to cover sharp edges (even if your table is round). Remember, corner and edge bumpers are not just for furniture - don't forget to look at planters, fireplaces, steps and so on. Infant safety outlet covers are essential for preventing curious baby fingers from exploring the plug points in your baby nursery and home. Those little holes are just irresistable and have to be touched, prodded and poked! 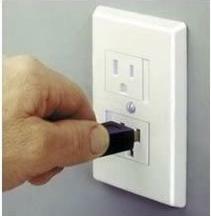 Make sure all plug points not in use are shielded by outlet covers. The most convenient are these safe plate covers which slide back into position the instant that a plug is removed from the socket. A less expensive alternative is the simple outlet cap. Easy to use, you just have to make sure you pop one in whenever you remove a plug from its socket. For outlets that are in use, you can prevent your little one from removing the plug and sticking pudgy fingers in the outlet holes by using one of these outlet cover and cord shorteners. As an added bonus you can hide up to 4ft of tempting electrical cord as well by winding it behind the cap. All babies and toddlers are irresistably drawn towards electric wires and plugs. Use these great devices to make sure your little one doesn't get mixed up amongst them. Use a power strip cover to cover up any power strips in your baby nursery and home. 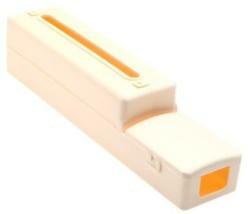 This power strip cover snaps easily into place and is easily removed by you, but not by your curious toddler! Use a baby safety equipment wire guard to cover any trailing electical wires from lamps, monitors, extension cords etc. Not only does it prevent inquisitive tugging and pulling but it also ensures that you won't trip over stray wires in the midnight hours. Carbon monoxide (CO) is the leading cause of accidental poisoning deaths in America, yet many people don't know they are suffering from CO poisoning until its too late. Since symptoms of CO poisoning are like the flu, you might not even know you're in danger at first. That's why a carbon monoxide alarm is an excellent way to protect your family. It can detect the CO you can't see, smell or taste in the air. A fire is something that you hope you will never have to deal with in your home. Unfortunately, it can happen and if it does every second counts. I'll never forget the shock in our home when we were evacuated two years ago because the house next door to us went up in flames and boy did it go up fast! A fire close up and personal is a scary thing - make sure you are not caught by surprise - install a smoke detector in several places in your home. I have one in the kitchen, garage and children's bedrooms. 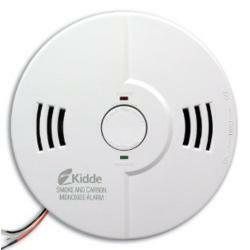 If you decide to install both a carbon monoxide and smoke detector, this combo unit is a good option. Sometimes the best way to ensure that a space is babyproofed is to close the door and keep your little one out of it. Of course, little ones are very ingenious and will soon figure out how to open a closed door since there must be something simply fascinating behind it otherwise it wouldn't be closed! The baby safety equipment solution to this ingenuity is a good door knob cover. Use one like this for a standard knob, or a latch like this for a lever opener. On the other hand, sometimes you want a door left open and for some reason your little one will insist that it should be closed. Use pinch guards to ensure that your baby's fingers do not get trapped in the door - ouch! If you have more than one storey in your home, a good window guard for every upper floor window is essential. The best is the Guardian Angel Window Guard. It comes in various adjustable sizes. Measure your windows to see which one will fit the best. Alternatively, use a window lock to ensure that windows remain closed. 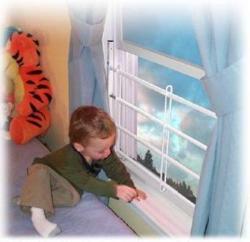 A blind winder is a great way to babyproof those dangerous blind cords. Unsafe cords have resulted in several infant deaths recently. 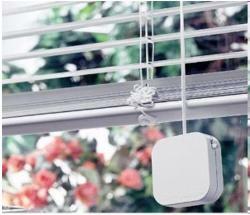 Unfortunately, just installing a blind cord winder won't make your blinds safe. You have to actually use it. This cord winder retracts automatically at the touch of a button like a tape measure so there's no tedious manual winding to discourage you from using this baby safety equipment item every time you need to. 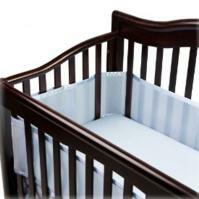 Crib bedding sets usually include a thick puffy bumper pad. These are unsafe for baby because they prevent the circulation of fresh air in the baby crib. A lack of fresh air can lead to SIDS. 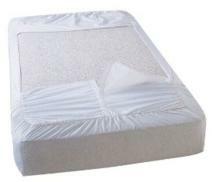 Puffy crib bumpers can also cause suffocation if your baby's face becomes wedged up against them. In the interests of infant safety it is not recommended that you use a crib bumper pad at all, but if you are worried about baby's arms and legs poking through the gaps between the crib slats, a breathable mesh crib bumper pad is the best option for safe infant sleep. This is essential baby safety equipment for preventing splinters in your little one's sensitive mouth. The best type of crib sheet for infant safety has a velcro strap that wraps around the bottom of the crib mattress thereby preventing it from coming loose. This secure-fit crib sheet is the best one I've found. The above baby safety equipment information is presented by Creative Baby Nursery Rooms for the purpose of educating mothers about infant safety in the home. We believe that the information provided on this site can help prevent baby safety accidents, however, an infant's safety is the responsibility of its caregiver alone. Creative Baby Nursery Rooms accepts no responsibility for any accident, which may occur as a result of any information on this site.